This month’s article is the ninth — and final — in a serialization of the author’s life and career as an independent manufacturers’ representative. Reprinted with permission from The Reputable Rep, Success in Sales and Life, by Sig Schmalhofer. This month’s article is the eighth in a serialization of the author’s life and career as an independent manufacturers’ representative. The reputable rep, like the distributors and contractors in his market, has both a financial and personal interest in the people he or she does business with. Reputable reps can be the glue that cements factory-customer loyalty. This month’s article is the seventh in a serialization of the author’s life and career as an independent manufacturers’ representative. This month’s article is the sixth in a serialization of the author’s life and career as an independent manufacturers’ representative. This month’s article is the fifth in a serialization of the author’s life and career as an independent manufacturers’ representative. In this, the age of instant communication, appointments with customers and clients are critical. Surprise hit-and-run sales calls are rarely effective. The exceptions, of course, are drive-by stops delivering samples, literature, etc. However, as discussed in the previous chapter, cold calls on a hunch, mining for business, should be in every reputable rep’s playbook. This month’s article is the fourth in a serialization of the author’s life and career as an independent manufacturers’ representative. This month’s article is the third in a serialization of the author’s life and career as an independent manufacturers’ representative. Prospecting is typically a cold call, but a cold call with a purpose. Possessing the fearless willingness to walk into a sales call where “you know no one” and “no one knows you” is critical. In the story below, a wholesaler sales rep investigates a potential new market. The result was a career changer. This month’s article is the second in a serialization of the author’s life and career as an independent manufacturers’ representative. If being a manufactures’ rep is a secret career, then plumbing is the secret business. 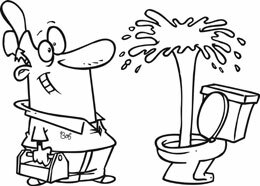 When the word “plumbing” comes to mind, most people think of the scenario pictured. They think about the guy who drags a drain snake to a home to unplug a toilet. This month’s article marks the first in a serialization of the author’s life and career as an independent manufacturers’ representative. The biggest challenge in the manufacturers’ rep business is explaining to people outside of our world what we actually do. Why do we pack the trunks of nice cars with reams of brochures and odd-looking displays and samples that would never make it through airline screening?